In July we started two surveys. 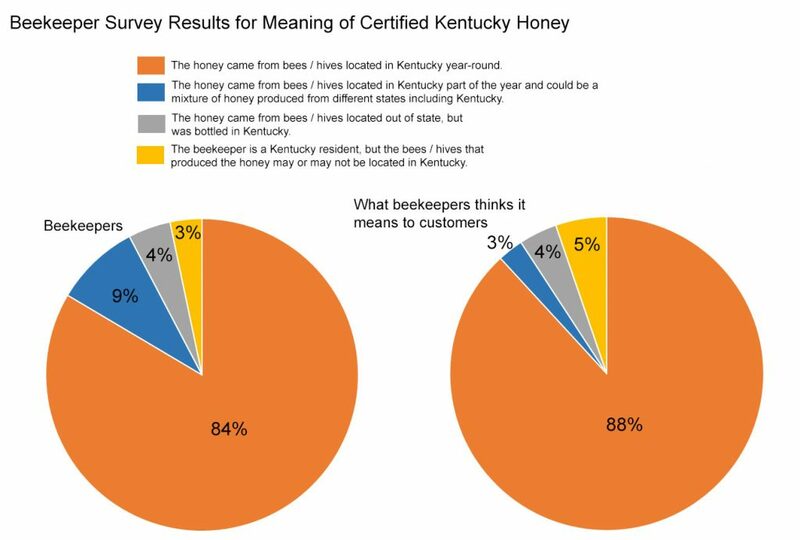 One asked Kentucky beekeepers for their opinions on pursuing a certified Kentucky Honey label. The second survey was aimed at gathering input from our customers about their thoughts and what is important to them when they buy honey. Results of the first survey were reported earlier. This report summarizes the results of the second survey focused on the consumers. Click on any of the images to view a larger version. The second survey started on July 29 and ran until October 5 in order to give as many people as possible a chance to respond. Posts about the survey could be found on the KSBA website and on the KSBA Facebook page. Every person with an email address listed as a contact on the KSBA local organization page was also emailed information about the survey and asked to share it with their members. In addition, fliers about the survey were printed and put in customers’ bags at the Honey Booth. A total of 93 people participated in the survey. Eighty-four of those people entered their survey answers online, while nine people printed the survey and mailed their answer to the KSBA webmaster. 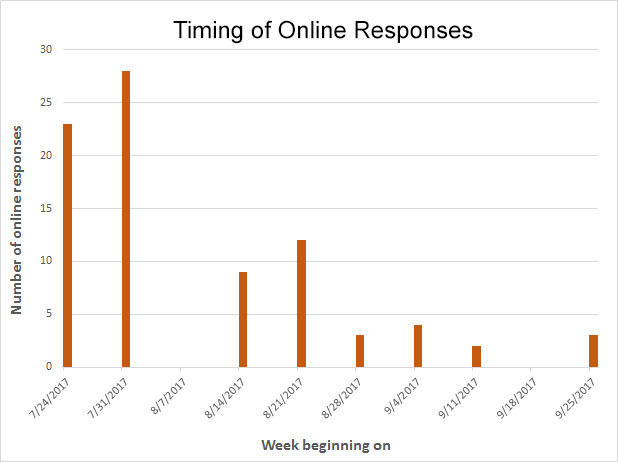 The graph below shows how many online surveys were received in each week that the survey was open. The weeks run from Monday through Sunday and the survey started on a Saturday. This question was asked because it seemed plausible that beekeepers and their family members may answer some of the questions differently than people who weren’t beekeepers and didn’t have a beekeeper in their family. 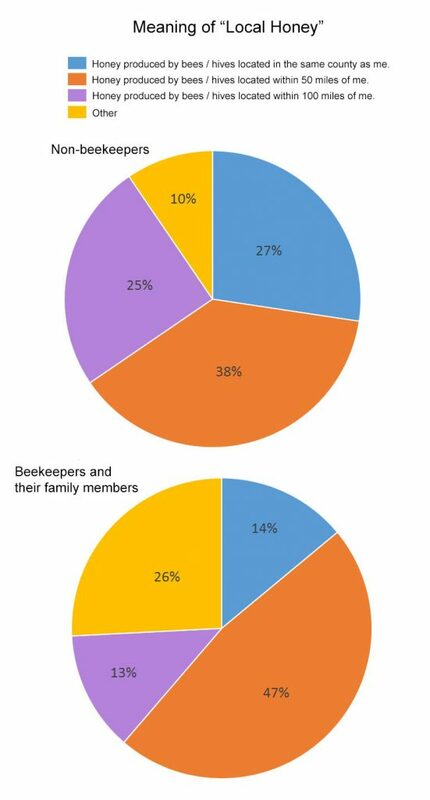 Approximately half of our responses came from each category (45 were beekeepers or had a family member who was a beekeeper, while 48 were not beekeepers and didn’t have a beekeeper in their family.) The remaining questions were analyzed so that the answers from the beekeepers and their family members could be compared to the answers from non-beekeepers. 2) What does the term “local honey” mean to you? For both groups, most people defined local honey as being as coming from within 50 miles of that person. Within each group, people were almost equally as likely to define local as being from the same county or within 100 miles. However, beekeepers and their family members were more than twice as likely to come up with a unique definition of “local” compared to the non-beekeeping group. 3) What does a Kentucky Proud label on a bottle of honey mean to you? In both groups, the most common answer was that it meant the honey came from hives / bees located in Kentucky year round. However, almost 3/4 of the non-beekeeper respondents gave this answer compared to only a little over half of beekeepers and their family members. Only 5% of non-beekeepers and only 4% of beekeepers and their family members believed it meant the honey came from bees / hives located out of state, but was bottled in Kentucky. 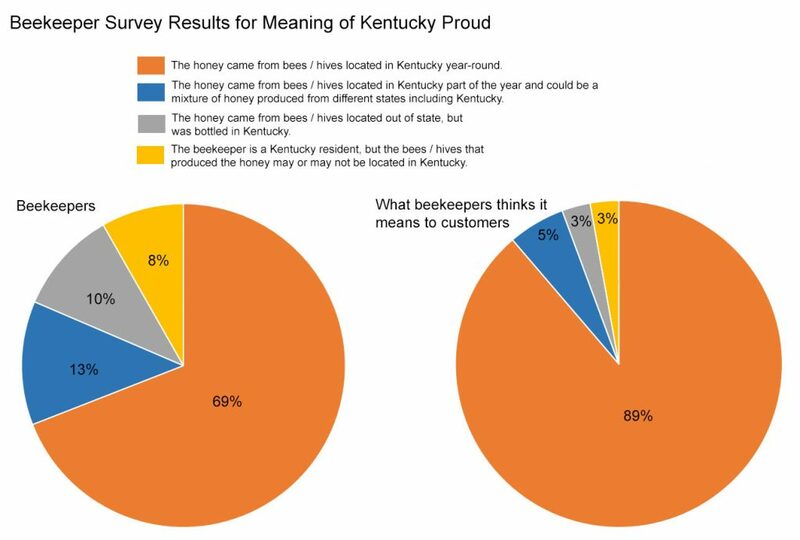 We asked the same question in the first survey asking Kentucky beekeepers for their opinions on pursuing a certified Kentucky Honey label, except that we asked them to answer for themselves and also tell us what they thought it meant to the their customers. The idea was to allow us to directly compare what we think our customer will say with what they actually do say. Pie charts showing the results from that survey are below. The “other” answers were removed from these pie charts because it often wasn’t clear if the beekeeper was answering for his or herself or for his or her customer. 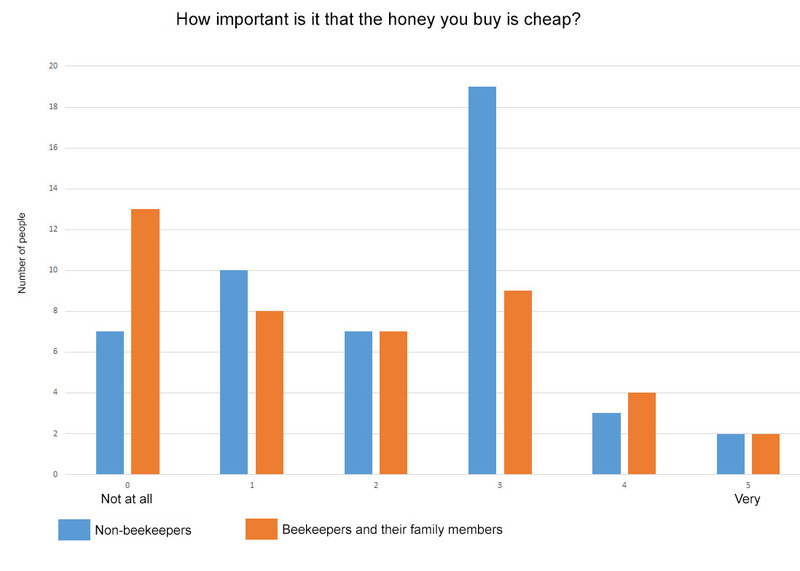 This should be kept in mind when comparing these pie charts to the ones from this survey, especially when such a large percentage of the beekeepers and their family members in the current survey had a definition that fell into the “other” category. 4) What would a Certified Kentucky Honey label on a bottle of honey mean to you? 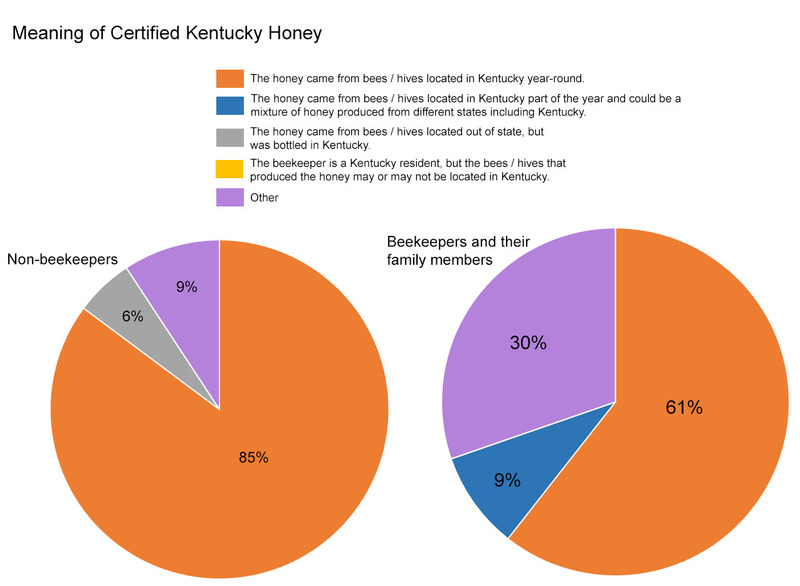 By far the most common answer for both groups was “the honey came from hives / bees located in Kentucky year round.” Almost a third of the beekeepers and their family members had their own unique definition for what a Certified Kentucky Honey label would mean, while only 9% of non-beekeepers had a different definition. The only other meaning of a Certified Kentucky Honey label for beekeepers and their family members (9%) was “the honey came from bees / hives located in Kentucky part of the year and could be a mixture of honey produced from different states including Kentucky.” None of the non-beekeepers chose that as a definition for a Certified Kentucky Honey label. Instead, 6% of non-beekeepers thought this label would mean the honey came from bees / hives located out of state, but was bottled in Kentucky. 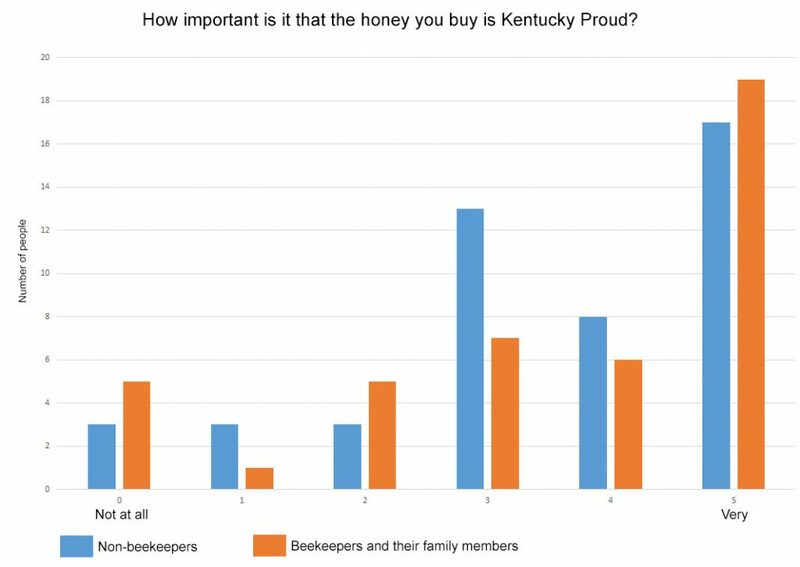 Once again, we asked this question in the first survey asking Kentucky beekeepers for their opinions on pursuing a certified Kentucky Honey label. Like with the Kentucky Proud question, we asked them to answer for themselves and to tell us what they thought it meant to their customers. Pie charts showing the results from that survey are below. Again, the “other” answers were removed from these pie charts because it often wasn’t clear if the beekeeper was answering for his or herself or for his or her customer. This should be kept in mind when comparing these pie charts to the ones above, especially when such a large percentage of the beekeepers and their family members in the current survey had a definition that fell into the “other” category. 5) On a scale of 0 (not at all) to 5 (very), how important is it to you that the honey you buy is…..? 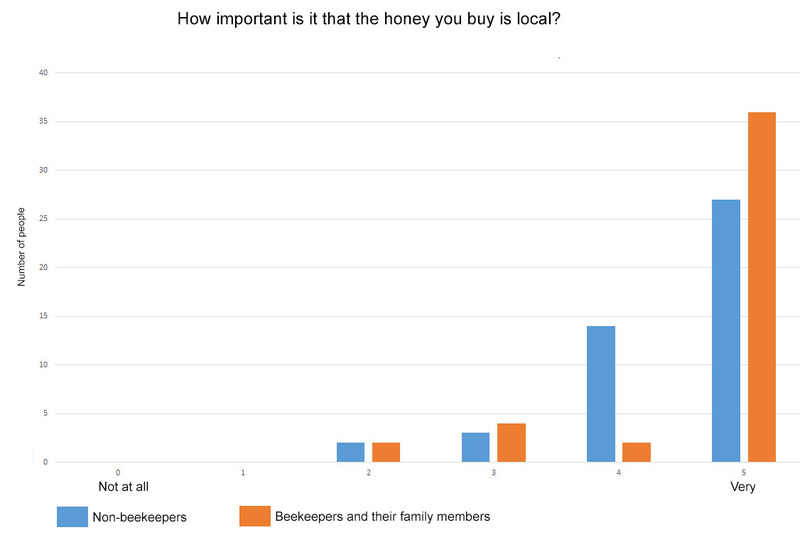 The graphs below show how important the respondents rated each of the following categories when they buy honey. 6) You have two 1-pound jars of honey. One is from bees that gathered the nectar from an unknown location. One is from bees that gathered the nectar from flowers in Kentucky. How much would you pay for each? 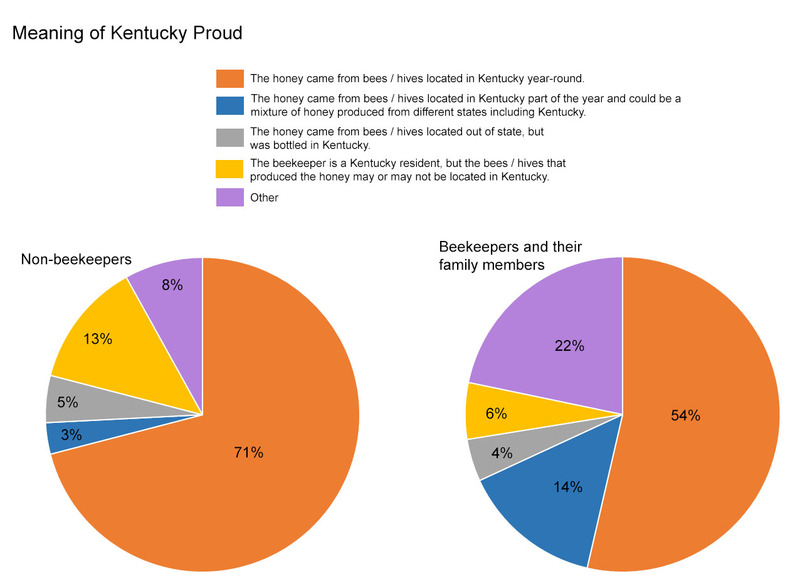 The two graphs below illustrate the distribution of each group’s answers for nectar from an unknown location and nectar from flowers in Kentucky. 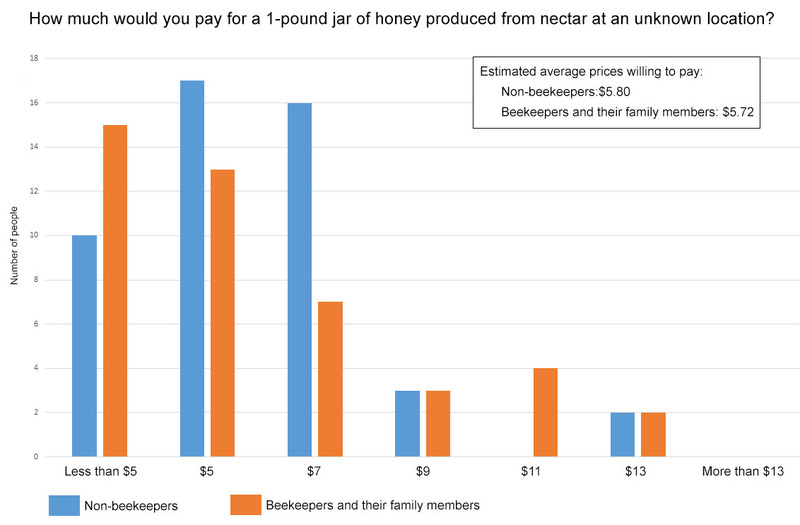 Each graph also shows an estimated average price each group reported being willing to pay for the different nectar sources. For calculating the estimated average prices, I assigned $3 to any answer of “less than $5” and $15 for and answer of “more than $13.” Using those values, non-beekeepers are willing to pay an average of $5.80 for a 1-pound jar of honey from an unknown nectar source, while beekeepers and their family members are willing to pay an average of $5.72 for the same jar of honey. 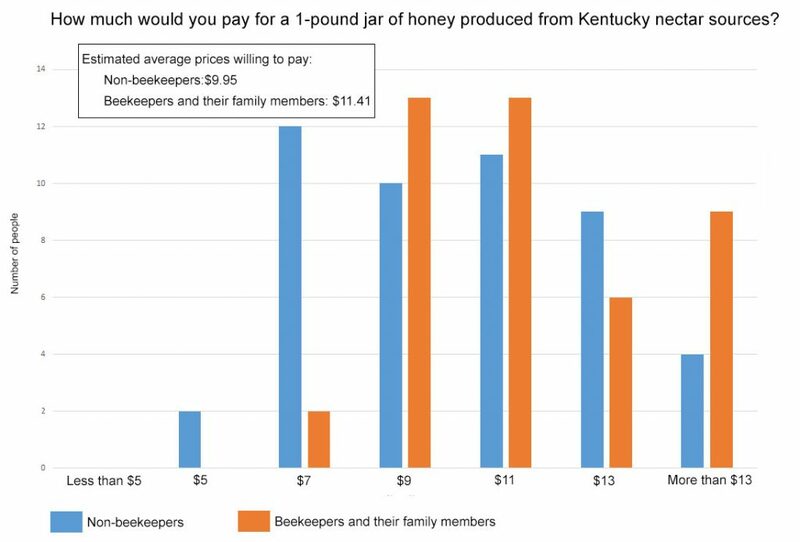 On the other hand, non-beekeepers reported being willing to pay an average of $9.95 for honey from a Kentucky nectar source, while beekeepers and their family members reported being willing to spend an average of $11.41. 7) Would you like more information about….? 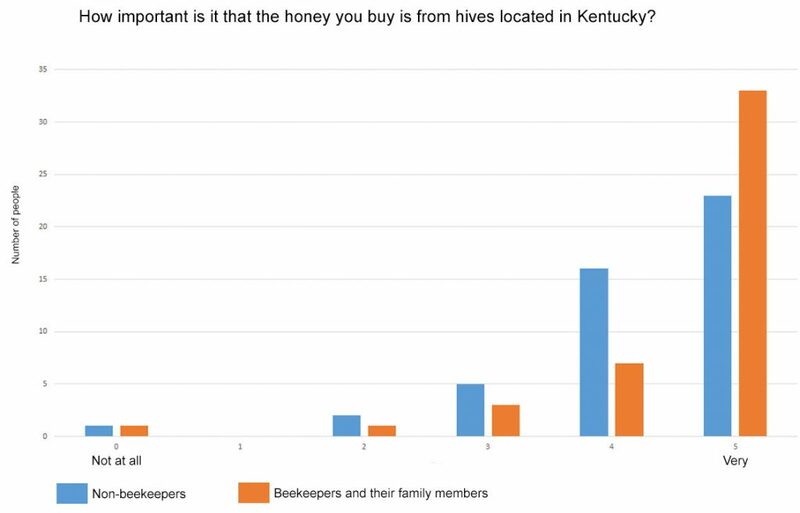 Nineteen people asked to be sent information about where to buy local honey from Kentucky beekeepers and 14 people asked to be sent information about becoming a Kentucky beekeeper. Emails with the requested information will be sent to those people soon.